As Americans seek to find an alternative to the stark and unappetizing choice of accepting Iran's rabid leadership having nuclear weapons or pre-emptively bombing its nuclear facilities, one analyst offers a credible third path. Interestingly, it's inspired by a long-ago policy toward a different foe – the Reagan administration's ways of handling the Soviet Union – yet this unlikely model offers a useful prototype. Abraham D. Sofaer, a former U.S. district judge and legal adviser to the State Department, now a senior fellow at the Hoover Institution, argues in Taking On Iran: Strength, Diplomacy and the Iranian Threat (Hoover Institution, 2013) that since the fall of the shah during the Carter administration, Washington "has responded to Iranian aggression with ineffective sanctions and empty warnings and condemnations." Not since 1988, he notes, has the U.S. government focused on the Iranian military force that specifically protects the country's Islamic order and most often attacks abroad, variously called the Pasdaran or Sepah in Persian and the Iranian Revolutionary Guard Corps or IRGC in English. This roughly 125,000-strong elite force, created in 1980, has an outsized role in Iran's political and economic life. It possesses its own army, navy, and air force units, it controls ballistic missile programs, and it shares control over the country's nuclear program. It runs the Basij, which enforces strict Islamic mores on the Iranian public. Its military forces are more important than the regular armed forces. Its Quds Force of about 15,000 agents spreads the Khomeini revolution abroad via infiltration and assassination. Its graduates staff key positions in the Iranian government. 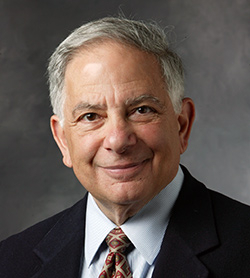 Abraham D. Sofaer of the Hoover Institution. The IRGC has played a lead role attacking Americans, their allies, and their interests, especially when one includes the IRGC's many documented surrogates and partners, such as Hezbollah, Hamas, the Muqtada al-Sadr movement, even the Taliban and al-Qaeda. IRGC accomplishments include the 1983 Marine barracks and U.S. Embassy bombings in Lebanon, the 1992 and 1994 bombings of Jewish targets in Argentina, the 1996 Khobar barracks bombing in Saudi Arabia, the 2011 attempt to kill the Saudi ambassador in Washington, and provisioning Hamas with missiles for its 2012 war with Israel (which are already being re-provisioned). In all, IRGC attacks have caused the deaths of more than 1,000 American soldiers, and many more members of other armed forces and non-combatants. The U.S. government has condemned the IRGC as a state sponsor of terrorism and designated it as a proliferator of weapons of mass destruction. Sofaer advocates a supple two-pronged approach to Tehran: "confront IRGC aggression directly and negotiate with Iran." Confrontation means Washington exploits "the full range of options available to curb the IRGC short of preventive attacks on nuclear sites." He argues that U.S. forces have the right to and should target factories and storage facilities for arms, facilities associated with the IRGC (bases, ports, trucks, planes, ships), arms shipments about to be exported, and IRGC units. Sofaer's goal is not just to curb IRGC violence but also to "undermine IRGC credibility and influence, and help convince Iran to negotiate in earnest" over its nuclear weapon program. Negotiations means talking to Tehran about outstanding issues, rather than trying to punish it with aloofness. 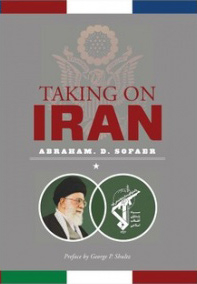 Sofaer quotes James Dobbins, a former special U.S. envoy to Afghanistan, as expressing this view: "It is time to apply to Iran the policies which won the Cold War, liberated the Warsaw Pact, and reunited Europe: détente and containment, communication whenever possible, and confrontation whenever necessary. We spoke to Stalin's Russia. We spoke to Mao's China. In both cases, greater mutual exposure changed their system, not ours. It's time to speak to Iran, unconditionally, and comprehensively." More broadly, along with Chester A. Crocker, another former American diplomat, Sofaer sees diplomacy as "the engine that converts raw energy and tangible power into meaningful political results." 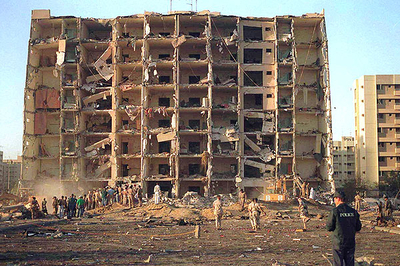 The IRGC coordinated the 1996 Khobar Towers barracks bombing in Saudi Arabia, killing 19 U.S. military personnel. Confronting and negotiating in tandem, Sofaer expects, will put great pressure on Tehran to improve its behavior generally (e.g., regarding terrorism) and possibly lead it to shut down the nuclear program, while leaving available a preemptive strike on the table "if all else fails." Former secretary of state George P. Shultz, in his foreword to Taking on Iran, calls Sofaer's idea "an alternative that should have been implemented long ago." Indeed, the time is well overdue to respond to IRGC atrocities with the language of force that Iranian leaders only understand – and which has the additional benefit of possibly avoiding greater hostilities. I'm at a loss to see how any kind of post-Stalin Cold War 'engagement' with Ahmadinijad will save Israel or the region from his genocidally insane -- but also serious -- plans to eradicate the State of Israel from the map, and with it, all its Jewish citizens. Anne Mandelbaum's question is a good one. Many differences exist between post-Stalinist Soviet leaders and those currently leading the Islamic Republic of Iran. Among those differences, the point made by Ms. Mandelbaum about the religious zeal and crazed and hateful rhetoric of Iran's leaders is the most troubling. I cannot pretend to know whether Iran actually plans to "wipe Israel of the map," as some of its leaders have said, and I would take such statements seriously in determining whether to support an attack on Iran's nuclear facilities if the more limited attacks and diplomacy I recommend fails to convince Iran to shift course. We still have the time to try the approach I have suggested in my book, without facing the risk of actually trusting that Iran will not use any nuclear weapons it obtains. Beyond this basic point, I believe that negotiating with Iran on the basis of sound negotiating principles, and in the context of attacks on the Iranian Revolutionary Guard Corps, has a good chance of improving the situation we currently face. I negotiated with high level Iranians for five years, between 1985 and 1990, and I found them to be difficult but serious, and my negotiations succeeded in bringing about several sound agreements with which Iran complied. The venomous and threatening statements of some Iranian leaders should not prevent the US from testing Iran's willingness to respond to a sound diplomatic posture, and if we are successful in diminishing the stature of the IRGC as well as demonstrating that engagement with the US can be fruitful, the people with whom we will be dealing in Iran may well be different ones from those we currently face. Ultimately, moreover, no assurance exists that the US (or even Israel) will in fact launch preventive attacks on Iran, despite the risks we will all face if it becomes a nuclear-armed state. In fact, if the US is unwilling to go even as far as I have proposed, Iran is likely to assume the US will in fact accept an outcome based on containment rather than prevention, regardless of how the US ends up acting. Limited uses of force aimed at the IRGC, now, for its blatantly illegal conduct, would at a minimum alter Iranian strategic calculations while testing the potential for a peaceful resolution of the nuclear issue.